On New Year’s Day, I attended the Raptors-Pacers game. To the surprise of many in attendance, and many more casual fans, the Raptors came away from that game victorious, just one day after beating the Chicago Bulls at the United Center. On the day of the Pacers game, the Raptors had gone 9-3 and were in clear possession of the Atlantic Division title since trading Rudy Gay on December 8th. They also appear poised to take over third in the conference by the end of January in the wake of the season-ending pectoral injury to Atlanta’s Al Horford. So what are the Raptors to do? They still have Kyle Lowry, who is a very tradable piece as a quality starting point guard on an expiring deal. There are several teams in playoff contention (Charlotte? Golden State? Err, New York?) that may want Lowry at some point this season, and may be willing to make a trade to get him. There is also Amir Johnson, a useful power forward who can rebound and defend the rim, and is even working on (gulp) a corner three. There could be a market for him as well. Trading either Lowry or Johnson will likely lead to at least an additional draft pick in the upcoming 2015 draft. That would be great, but are the Raptors building toward next year, or should they focus on the current season? Tanking is generally seen as the best path when a team is projected to finish outside of the playoffs. This season, even teams that could have made a move or two to get into the playoffs, have instead chosen to stand pat or even make moves to finish worse. The upcoming draft is so loaded with high-end talent, like Andrew Wiggins, Jabari Parker, and Julius Randle, that only the teams built to win now are trying to do so. The Raptors appeared, on the surface at least, to be following the tanking path when they offloaded Rudy Gay, plus Quincy Acy and Aaron Gray, to the Sacramento Kings in exchange for backups Greivis Vasquez, Patrick Patterson, John Salmons and Chuck Hayes. The move is more of a gamble for the Kings; Gay has a player option for next season, that he may or may not to use, which could free up a considerable amount of salary for the Kings. 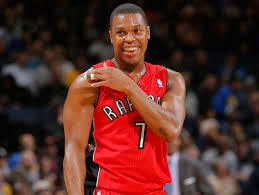 But then, as has been well documented, the Raptors got hot. Really hot. Which brings me to New Year’s Day. The weather was absurdly cold. I had just watched the Leafs top the Detroit Red Wings in the Winter Classic (sponsored by Bridgestone), and our spirits were high. We arrived with some time to spare, and helped ourselves to beer and merchandise. The arena filled before tip-off, and the crowd was quiet, but calm, and there was a positive buzz that I have not seen at a Raptors game since… well, since ever. At halftime, the Raptors were down by four points, and Paul George had been all but invisible. Pacers centre Roy Hibbert had already picked up 3 fouls, and would eventually foul out by the middle of the fourth quarter. The crowd really got into it in the third quarter, and the Raptors caught fire. Even John Salmons nailed a three-pointer, while DeMar DeRozan continually carved up the Pacers interior defense using quick cuts off of ball screens, especially with Hibbert playing tentatively, and then not playing at all. 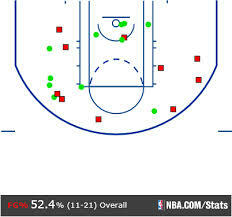 DeRozan’s Shot Chart against the Washington Wizards on Friday night. Hibbert went to the bench to thunderous cheers after his sixth foul. Even better, with a minute to go in the game, Pacers coach Frank Vogel pulled all of his starters and dumped the substitutes onto the floor, which also got a massive cheer. Superstar Paul George finished the game with just 12 points, as he was consistently harangued by one or more Raptor defenders. Since that game, the Raptors embarrassed the Washington Wizards in D.C., then stood tall against the Miami Heat to the last minute before ultimately falling. They lost to the Pacers last night, which puts them at 10-5 since the Gay trade. After a brief period above .500, they are still in a very strong position with four consecutive winnable games coming up (home against Detroit, Brooklyn and Milwaukee, then at Boston). The team ahead of them, the Atlanta Hawks, have not won a game yet in January (0-3, with a game against Indiana tonight), and are free-falling. 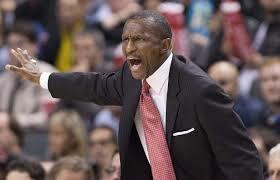 What’s more, Toronto’s Dwane Casey has just been named coach of the month in the Eastern Conference for December, so that’s something. Are the Raptors a team that should be thinking about tanking? Quite the contrary. They are streaking right now, and we have already seen top contenders suffer injuries to key players this season. When Russell Westbrook injured his knee back in the second round of the playoffs in May, his Oklahoma City Thunder went from favourites to eliminated in three weeks. The Pacers, by the way, who came within one game of defeating the Heat in the Eastern Conference Finals last season, were the 3-seed in the East. So while the Milwaukee Bucks or Utah Jazz might be playing themselves into a position to acquire a potential superstar in this summer’s draft, I’d still prefer to ride along with the rolling Raptors. In a town of so much sporting disappointment, we are being treated to a very pleasant surprise. Let’s not ruin it by crying out about picks and tanking. Let’s just enjoy some professional sporting success. Who can forget the crushing, and long-lasting, despair of the 2013 Blue Jays season? Or the heartbreak, quick and brutal, of the Maple Leafs collapsing in Boston in May? Haven’t we had enough losing around here? Losing on purpose? Come on, man, Toronto does that best organically. Besides, it’s not like lottery picks are guaranteed locks to be successful, even those with massive hype. Isn’t that right, Andrea?Michael? Kwame? Darko? Hasheem? Greg? Exactly. I’ll say it unabashedly: Go Raptors!